Soft, fresh bread crumbs offer more texture than dried bread crumbs. For a nutty flavor, use whole-wheat bread. Preheat oven to 350°F. Lightly coat two rimmed baking sheets with cooking spray. Place chicken between 2 sheets of plastic wrap and lightly pound to an even 1/2-inch thickness. 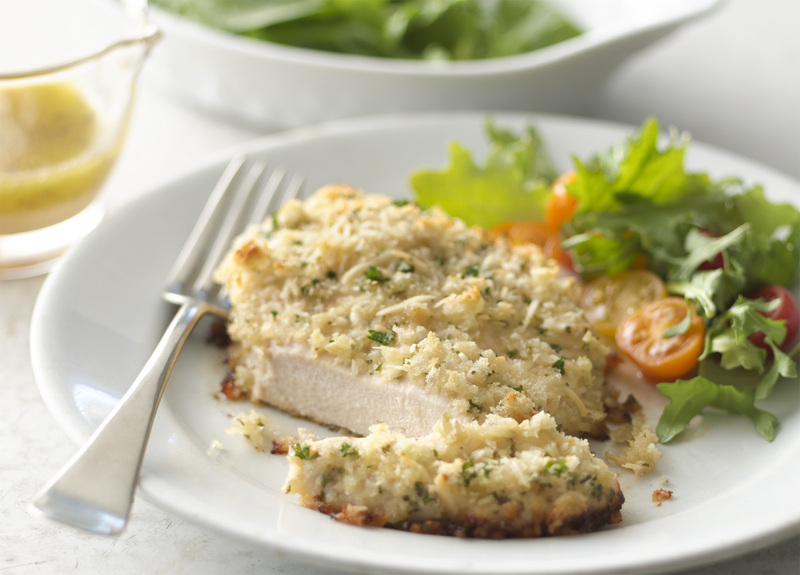 Stir together bread crumbs, Parmesan cheese, and parsley in a shallow dish. Dip each chicken breast into butter mixture, coating all surfaces. Press both sides into bread crumb mixture. Place chicken on prepared baking sheets. Bake for 30 to 35 minutes or until chicken is lightly browned and thoroughly cooked.